The maxillary central incisors play an important role in smile esthetics. The absence of a central incisor can affect esthetics, phonetics, and function. Permanent maxillary central incisor impaction can occur due to supernumerary teeth, cyst, abnormal tooth bud position, trauma to the deciduous incisor in childhood, etc. 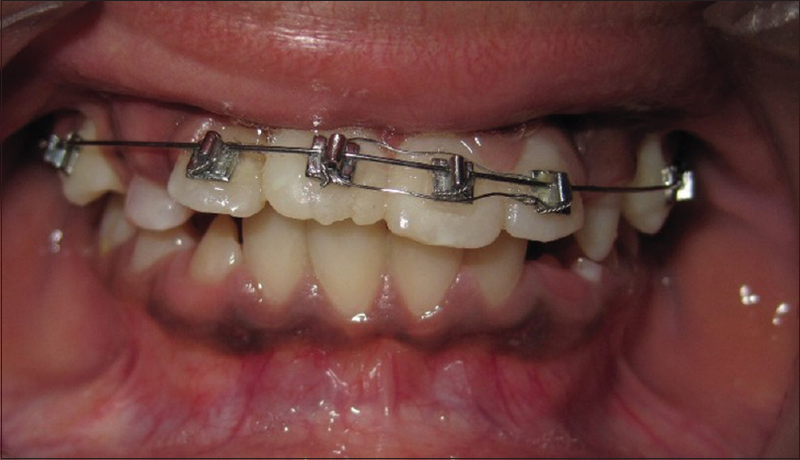 The purpose of this article is to discuss maxillary central incisor impaction due to childhood trauma and orthodontic intervention in its management, with an example of a case treated by two-stage surgical exposure and orthodontic traction. A 9-year-old boy reported to the Department of Orthodontics, AECS Maaruti College of Dental Sciences and Research Centre, Bengaluru [Figure 1]. Patient's father complained of a missing upper right permanent tooth. He gave a history of childhood trauma to the patient due to a fall, during playtime at school, but failed to remember the exact age at which the trauma occurred. On examination, over-retained fractured deciduous right central incisor was found. The incisal edge of the permanent central incisor was palpable deep in the vestibule. Panoramic radiograph showed a dilacerated permanent maxillary right central incisor which had rotated upwards, as if moving towards nasal cavity [Figure 2]. 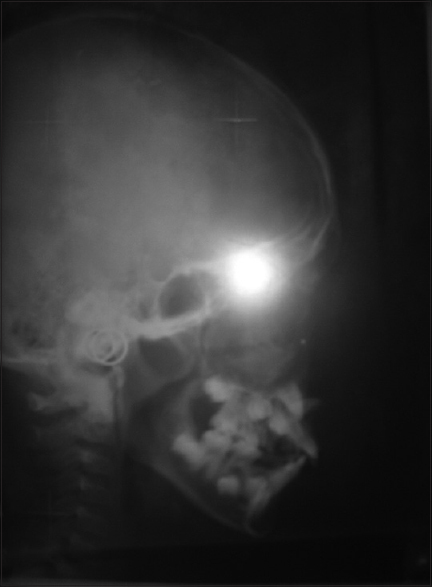 Lateral cephalometric radiograph revealed the angulation of its crown [Figure 3]. Interdisciplinary treatment approach was planned. The over-retained deciduous incisor was extracted. Straight wire appliance therapy was ideal and was suggested but patient chose Beggs appliance. So, Beggs brackets were bonded to the teeth and the permanent maxillary first molars were banded. Initial alignment was done with 0.016″ nickel titanium wire for 3-4 months. Next, 0.018″ stainless steel Australian wire was placed for 2 months followed by 0.020″ special plus Australian wire as the base wire. Then the impacted central incisor was surgically exposed by using a full thickness flap, and a Beggs bracket was bonded to the exposed lingual surface of the crown [Figure 4] and a pigtail ligature wire connected the bracket to the piggy back 0.014″ niti archwire, through the closed full thickness flap. The impacted central incisor was gradually pulled by the piggy back nickel titanium wire, by closed eruption technique [Figure 5]. The tooth rotated down, this was clearly evident on an Intraoral periapical (IOPA) radiograph after a few months. 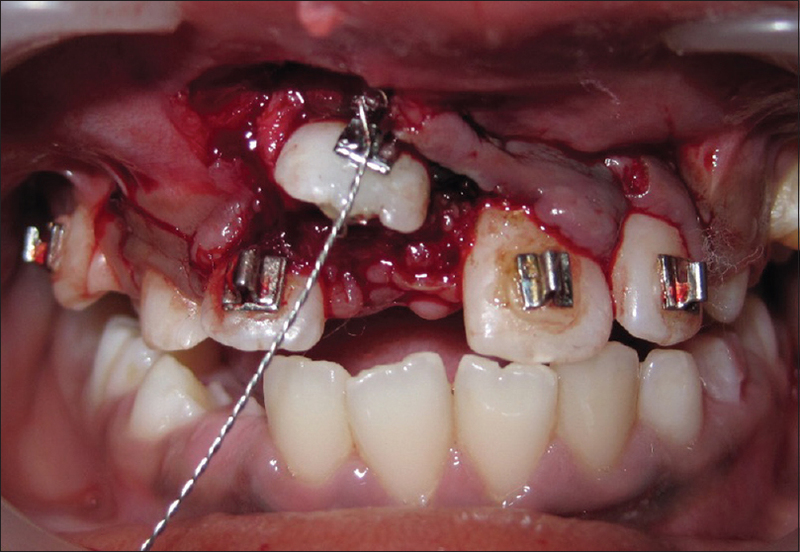 Now, a second-stage surgical exposure was done to expose the crown of the right central incisor and the lingual attachment was removed and a Beggs bracket was bonded on the buccal surface [Figure 6] and connected through a pig tail ligature wire to the piggy back niti wire. Orthodontic traction force was exerted and the central incisor moved down and penetrated the mucosa to make its appearance in the oral cavity [Figure 7]. Later, it was aligned and leveled in the arch, to increase the smile esthetics. Childhood trauma can cause permanent central incisor impaction. Management requires careful planning and an interdisciplinary approach to move the incisor to its correct position in the arch using light orthodontic traction force. Nelson SJ. Wheeler′s Dental Anatomy, Physiology and Occlusion. 9 th ed. India: Saunders; 2010.
do Espírito Santo Jácomo DR, Campos V. Prevalence of sequelae in the permanent anterior teeth after trauma in their predecessors: A longitudinal study of 8 years. Dent Traumatol 2009;25:300-4. Becker A. Orthodontic Treatment of Impacted Teeth. 3 rd ed. USA: Wiley Blackwell Publishers; 2012. Huber KL, Suri L, Taneja P. Eruption disturbances of the maxillary incisors: A literature review. J Clin Pediatr Dent 2008;32:221-30. Becker A, Chaushu S, Casap-Caspi N. Cone-beam computed tomography and the orthosurgical management of impacted teeth. J Am Dent Assoc 2010;141 Suppl 3:14S-8S. Pavoni C, Mucedero M, Laganà G, Paoloni V, Cozza P. Impacted maxillary incisors: Diagnosis and predictive measurements. Ann Stomatol (Roma) 2012;3:100-5. Nienkemper M, Wilmes B, Lübberink G, Ludwig B, Drescher D. Extrusion of impacted teeth using mini-implant mechanics. J Clin Orthod 2012;46:150-5.